It began rather suddenly, with a decision that I needed something new and different. It began with a small number of quick dates, speed dating of a sort that lasted just long enough for me to know what I did not want and to settle on what I did. It only took a matter of hours for me to commit to my new significant other. It might seem abrupt, but we have now begun to co-habitate, and as I write this I glance over to see them in my driveway. You see, I bought a new car. Maybe that is no big deal to you. Perhaps it is something you have done dozens of times, buying a new car every few years, but not me. This is the very first car I have ever bought on my own, a novel experience I now savour in my head as I write about it. My old car was a small gold Ford Escape. It was the car I got when I divorced, a reliable beast that had been driven to site for a couple of years before it came to me. It was in relatively good shape, but in the last few months the reliability had begun to falter. And so too had my relationship with it, as the car was one of the last remnants of a marriage now over and lives that have moved on. It was a reminder of the past, one of the few remaining in my life, and I knew it was time to end that relationship, too. But there was a sticking point. I have never bought a car, and I was terrified. You see growing up my father had regularly brought home new cars (always Fords, as for him only Ford made real cars and only John Deere made real tractors) and when I married my husband did the same. I had never been part of the process, never even test driven a car, never really set out to buy a car...and so I was afraid, even though in the past two years I have done bold things like bought my own house. Buying a car, though, was a daunting new adventure. That's where my friend Arianna came in. Arianna is one of those friends who is there whenever you need them, good times and bad. She is one of those people of whom you say "I can count on her", but it is so much more than that as you don't even need to ask what you want as she is already thinking it. I told her I was looking to buy a new car, and she immediately asked if she could come with me - and so we set out on an adventure. I had been looking at cars online, but I can't help it. I am my father's daughter and so my web browser kept finding itself on the Ford website, looking through their lines of vehicles. It seems I could not imagine deviating from his legacy, and so this woman who wears a John Deere t-shirt and cap when she mows her lawn, headed to NorthStar Ford. I don't intend this blog post to read as an endorsement of those I have dealt with on this journey, but I am afraid it probably will as I have encountered such incredible people along the way. The minute I stepped into NorthStar Ford I told them I was new to this - and they took that to heart, setting me up with the most patient salesperson and finance person they could. In a three-visit process Alexsis and Hassam took me from novice to expert, guiding me through the entire transaction until yesterday, keys in hand, I drove out of the stunning new facility NorthStar has built and into my next adventure. Along the way I encountered others who were so kind they must be mentioned - Lana from AMA who handled my insurance transaction, telling me stories as we went and her gentle friendliness a strong counter to my evident nervousness about this entire thing (incidentally AMA has my loyalty forever, as when I went to insure my new home and change over ownership of my old car after my separation they were so incredibly kind and patient with me, the agent telling me how brave and strong I must be, kind words from a stranger that came at just the right time). There was the young woman from the BMO who handled getting me a certified cheque, and at every turn I reflected on the remarkably efficient and kind service I received in a town often derided for the exact opposite. I test drove three different cars, all from the SUV class of vehicle with which I have become comfortable. It was the last one I drove that I fell for, a blue creature with a moon roof and a traditional SUV type style which appealed to me. I suppose in some ways it was as close as I could get to my father's F-150 without actually getting a truck I simply don't need, and it made me think of him as he loved the colour blue just as I do. And the name of the vehicle was not lost on me, either, as it was not designed to "escape" or to live on the "edge". It was meant to be an explorer. 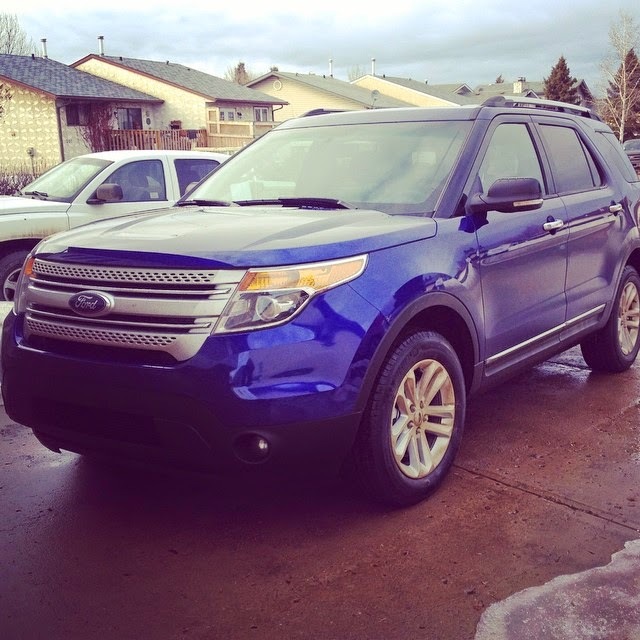 When I came home I told the Intrepid Junior Blogger I had purchased a new car, a bright blue Ford Explorer, and that she would need a name. One of my colleagues had suggested Dora, but the IJB was vehemently opposed to this name and so we discussed it for a bit. Late that night, just before bed, I found her downstairs and suggested we name our new friend after a famous female explorer, and the IJB was intrigued. When she asked the name I said: "Let's call her Amelia." "After Amelia Earhart?" she said. "Didn't she get lost?" she asked, fixing me with a quizzical look. "She did," I said, "and has never been found." "But here's the thing," I continued. "I think Amelia Earhart was the kind of person who would have rather gotten lost doing what she loved than been safe staying in one place forever. That's what an explorer is. Maybe that's what life is." And the IJB looked at me, a smile spreading across her face. "Amelia is a good name," she said, and so it was settled. You see I suppose this entire journey of buying a car has been an exploration for me, just as my entire life has been. I haven't always taken the right direction - and on occasion I have gotten lost. But like Amelia Earhart I would rather get lost exploring than be safe by staying still, and if I only ever teach the IJB one lesson that might be it. Life is an exploration - and one should never let fear of getting lost stop you from living it. This is Amelia. This isn't the end of an adventure, you see. It's just the beginning.